I've just come across the most WONDERFUL site...I think I've found heaven! I'm a lover of any type of unique, vintage jewelry so when I set my lovely brown eyes on the pages of this goldmine of a site, Carole Tanenbaum Vintage Collection, I cried in glory. You just must visit the site and see for yourself, I can't possibly explain the beauties you'll see...all original vintage. You'll want everything! 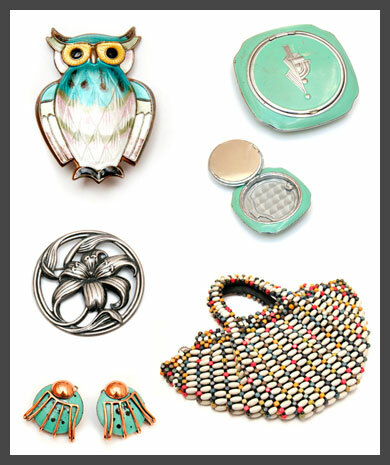 My finds, David Anderson Owl Pin, Deco Loose Powder Compact, Multi Color Czech Purse, Matisse (signed) Blue Speckled Enamel Round Earrings, Sterling Danecraft Day Lily Brooch.